There is no doubt that bike use is experiencing a resurgence, as confirmed by data from Auckland and Christchurch cycle counters. The NZ Government and local authorities are spending on cycling infrastructure, and for good reason. 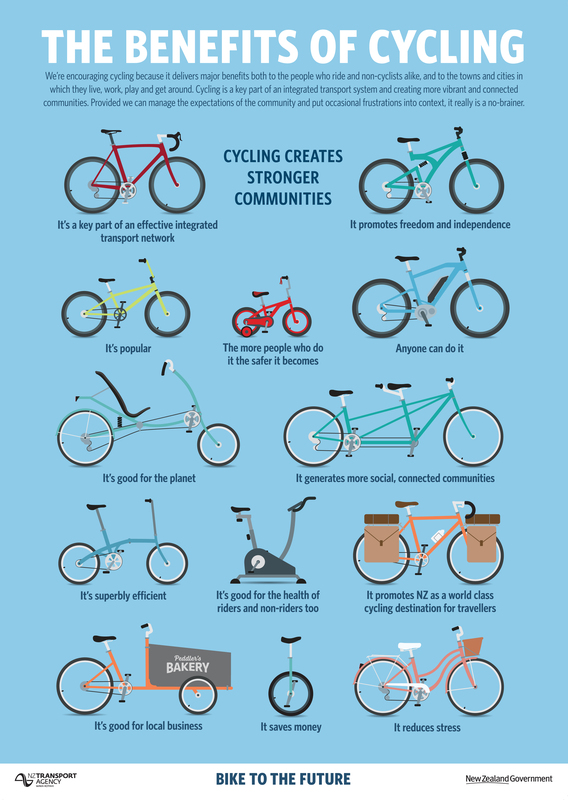 Bikes = Good, a whole lot of good. What is so good about bikes anyway? Cycling reduces the incidence of a range of serious illnesses. Regular aerobic exercise is known to cut the risk of heart disease, type-two diabetes, all types of cancer, high blood pressure and obesity, and evidence shows that New Zealand communities with higher numbers of people cycling and walking, especially for transport purposes, have better health profiles than those in less active neighbourhoods. In New Zealand, physical inactivity contributes to around 8 percent of all deaths, and one in three adults and one in ve children are overweight. The Ministry of Health reports that only 50.5 percent of New Zealand adults are regarded as sufficiently active for health benefits and physical inactivity is the second leading risk factor of disability adjusted life years. Declining rates of functional active travel have contributed to this population-level decrease in physical activity, and evidence suggests that rising levels of obesity are more pronounced in settings with greater declines in active travel. Studies by the British Heart Foundation say cycling just 32 km per week reduces the risk of heart disease to less than half, compared to people who don’t exercise. A study for British Cycling found that if people in urban England and Wales cycled and walked as much as people do in Copenhagen, the National Health Service could save around £17 billion within 20 years. According to a recent study published in the British Medical Journal, compared to participation in sport, active transport is attributed to a four times larger reduction in obesity. Cycling improves quality of life in towns and cities. ‘Quality of life’ rankings consistently show bike-friendly cities at the top. Cycling improves social connection in towns and cities. With some people more likely to be able to access recreational opportunities, and streets having a more pleasant ambience for spending time in, people are more likely to meet each other. Streets with lower levels of tra c are popular with people on bikes and on foot, and facilitate people being more likely to make friends with their neighbours and spend more time on their streets. Social isolation is therefore likely to be reduced. For young people, being able to cycle safely can mean gaining independence to attend sporting activities, clubs and other social and recreational pursuits when parents are not available to take them and public transport is not available. Engagement, connection, conversations: individuals – businesses – councils. Individuals and organisations more able to recognise and engage with businesses that support active transport, e.g. in planning events, activities and promotions focused on active transport. Helps individuals and businesses demonstrate their support for bike use in a wider context. Subtly helps balance out the vocal minority who oppose cycle infrastructure projects. 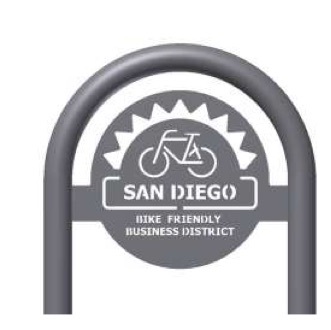 Helps bike users who are frustrated by bike parking shortfalls to quickly and easily identify and communicate their needs. Complements strategies to implement: traffic calming, increased physical activity, local business development, place-making. Shifting 5% of car trips to bicycle (short trips) could reduce emission impacts by up to 8%. The Queensland Department of Transport and Main Roads found that: “The combined environmental benefits of reducing noise and greenhouse gas emissions, and improving air quality, equates to around 5.9 cents per kilometre walked or cycled”. Many councils budget money for bike parking but find it hard to know how to situate it for best impact. 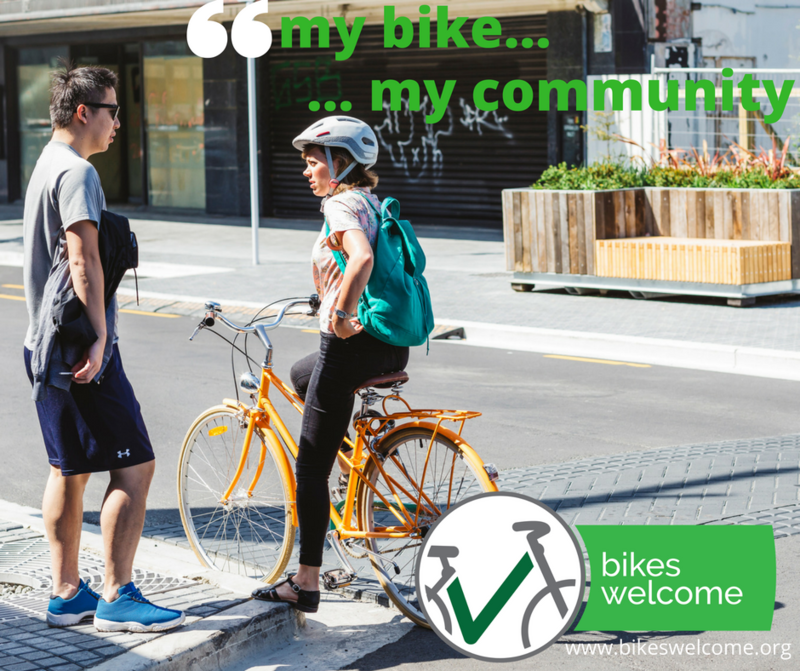 BikesWelcome will enable people to let their councils know where they need bike parking, potentially avoiding a ‘hit and miss’ approach or costly siting studies and customer research. More cycling means reduced costs for the council. In QLD they found that the avoided costs of infrastructure provision through a mode shift toward active travel equates to about 5.2 cents per kilometre. Across NZ, cycling is the third most popular recreational activity, with 24.8% of adults participating in it*. In New Zealand and overseas there are many examples of increased participation in cycling after cycling infrastructure has been built, including Auckland, New Plymouth, Napier/Hastings, and towns and cities near the NZ Cycle Trail. *Source: Sport New Zealand, 2015. Sport and Active Recreation in the Lives of New Zealand Adults. 2013/14 Active New Zealand Survey Results. Cycling potentially boosts retail spend. Various studies have shown that cycling infrastructure can lead to an increase in retail sales. People who cycle have been found to be more likely to stop and visit shops more often, and to spend more money at those shops over time, than people who drive. Retailers often overestimate the number of people who have driven to their stores. A study from Wellington, New Zealand showed that only 6 percent of shoppers on Tory Street were using the car parks along that street. Retailers also overestimate the contribution of car parks to their business. An Australian study found that switching one car park to six bike parking spaces could create an increase in retail spend related to that space, from $27 per hour to $97.20 per hour. Good cycling infrastructure also attracts people to visit. Reports from Hastings indicate that visitors are being attracted to the area because of its cycling opportunities and many local businesses are reporting signi cant growth. More bike-friendly towns and cities would also encourage visitors from the New Zealand Cycle Trail, who spend money in local communities. Cycling saves people money to spend in their local communities. With no fuel, registration, warrant of fitness and parking costs, and much lower purchasing, maintenance and insurance costs compared to operating a car, people who cycle have more money to spend on other things.